Designed by a team led by Kurt Tank, HAL produced the HF‑24 Marut for the Indian Air Force as a single‑seat ground attack fighter with subsonic performance. Work on the project began in 1955, to meet an Indian Air Force requirement, and first flight tests of the aerodynamic envelope were made in March 1959 with a full scale wooden glider. The prototype first flew on June 17, 1961 powered by two 4850 lb thrust Bristol Siddeley Orpheus 703 turbojets. The prototype has room for a second pilot, with dual controls, in the rear of the cockpit, but this space was to be normally occupied by armament, fuel, cameras or electronic equipment. 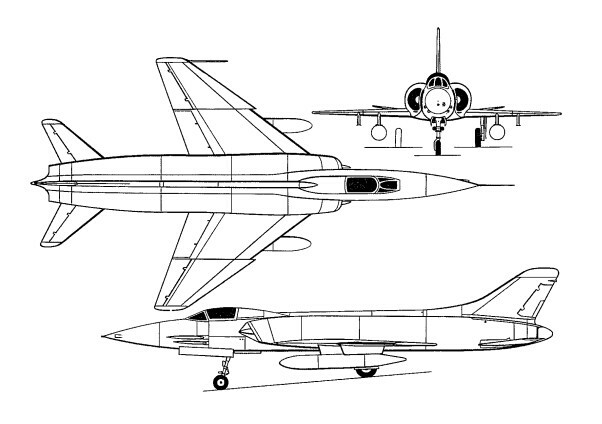 Production of 129 (plus 18 two-seat HF-24 Mk 1Ts two‑seat operational trainers) ended in 1977. Power for each production aircraft is provided by two 4,850 lb thrust Rolls‑Royce Bristol Orpheus 703 turbojet engines and armament comprises four 30‑mm Aden cannon and 50 68‑mm air‑to‑air rockets carried in a retractable pack in the lower fuselage. Under­wing stations can carry the usual selection of bombs, rockets, napalm tanks, and drop‑tanks.